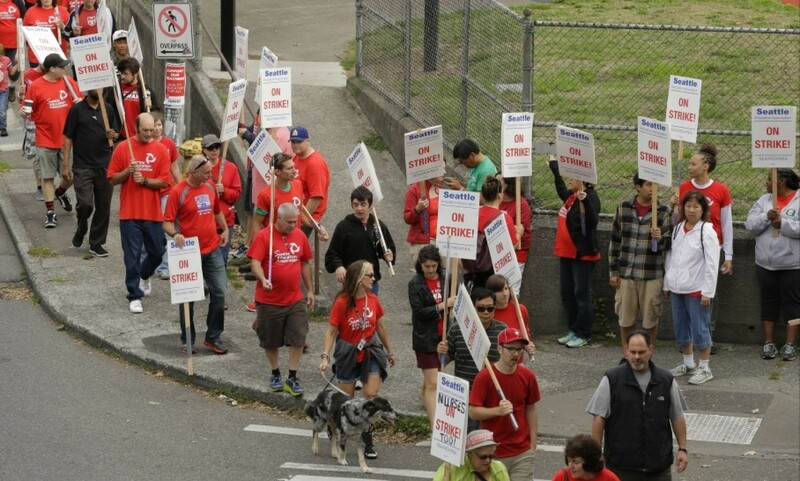 Seattle teachers just ended a strike. The fact that they would strike at all differentiates them from us. It's risky going on strike. It's also costly. In NY, you pay two days back for each one you strike. That's a side-effect of the draconian Taylor Law, which strips us of one of our strongest weapons. Of course, going on strike could also strip leadership of their right to automatic dues collection. They may lose that anyway in SCOTUS, but those dues dollars are pretty important. We've got hundreds of loyalty-oath signing faithful whose activism revolves around going to conventions. These are the ones who treat Mike Mulgrew like a rock star at the DA and hang on every word he says. These are the ones who answer phones at UFT after school, and if you've ever gotten bad advice from one these folks, it's probably because they were hired for loyalty rather than competence. I always tell my members call UFT, but if the person doesn't help you let me know and I'll find someone who will. What happens when teachers stand on principle rather than patronage? For one thing, teachers demanded, and won, guaranteed daily recess for all elementary school students — 30 minutes each day. In an era when recess for many students has become limited or non-existent despite the known benefits of physical activity, this is a big deal, and something parents had sought. That's remarkable. As a class size advocate, I wonder what would happen if UFT demanded reasonable class sizes. In all the time I've been a teacher, since 1984, the only instrument that has controlled class sizes has been the UFT Contract. And in all that time leadership has not taken a single step to improve it. They say they've gotten us money instead, yet we have to wait until 2020 for money everyone else got over five years ago. In a few weeks, maybe, we'll get a small slice of it. Go to a car dealership and ask if they'll give you a car now if only you can pay for it interest-free in five years. Teachers won an end to the use of student standardized test scores to evaluate them — and now, teachers will be included in decisions on the amount of standardized testing for students. This evaluation practice has been slammed by assessment experts as invalid and unreliable, and has led to the narrowing of curriculum, with emphasis on the two subjects for which there are standardized tests, math and English Language arts. Holy crap. That is a major victory. Here in NY, our union President helped craft the awful APPR law that every teacher I know is freaked out over. And he actually thanked the Heavy Hearts Assembly when they voted to make it even worse. Our brave brothers and sisters in Seattle said they weren't going back to work until they could be judged by something other than junk science. Would teachers in New York City stand up? Do teachers in New York City even know what a union is? Tough to say, since 79% of us voted for second-tier due process in a contract that settled for raises that were ten years late. Isn't union, you know, when we all stand together? Isn't union when we are all one? Not here, and not now, apparently. That has to change. As leadership has allowed our union to be so degraded, it will take some time. The cynicism engendered by consistent indifference to membership is pernicious, and will take a long time to reverse. But I've waited a very long time, and I can wait some more. We need to be what we can be, and there's no reason we can't learn to stand up, just as our brothers and sisters are doing in other parts of the country. We will get our heart back, no matter how long it takes. Who is Empowered in this Era of Ed. "Reform"?